The Curwen family is a very antient and respectable one. Their principal residence has long been at Workington hall in the county of Cumberland, where they had large possessions in landed property and coal mines. The last gentleman of that name and family was Henry Curwen, esq. ; late member for the county. It was chiefly by his interest that sir James Lowther, now earl of Lonsdale, lost his parliamentary interest in the famous contested election for Cumberland in the year 1768, when Henry Fletcher, esq; now a baronet, first obtained a seat in the House of Commons in conjunction with Mr. Curwen, who sat in the preceding parliament for the city of Carlisle. He left an only daughter, heiress to all his large possessions, who was married about three years ago, very young, to her paternal first cousin John Christian, esq; of Unerigg hall in the same county. It is remarkable of this lady, that she was the last and only living child of a great number, her mother, the late Mrs. Curwen, formerly Miss Gale, of Whitehaven, having had fifteen or more children, previous to the present lady, all either still born or that died within a few minutes after their birth. Arms in a lozenge, Arg. Frettè G a chief Az. Crest on a torse a horse passant. The mansion-house is a large quadrangular building, which still bears marks of great antiquity, notwithstanding various alterations and improvements, which have been made duting the last thirty years. The walls are so remarkably thick, that they were able, a few years since, in making some improvements to excavate a passage sufficiently wide lengthways through one of the walls, leaving a proper thickness on each side of the passage to answer every purpose of strength. It was within a very short distance of this house where the river Darwent empties itself into the sea that the unhappy Mary queen of Scots landed in 1568, after her escape from the castle of Dunbar, and subsequent defeat. She took refuge at this house, and was hospitably entertained by sir Henry Curwen, till the pleasure of Elizabeth was known; when she was removed first to Cockermouth castle and then to Carlisle. The chamber in which she slept at Workington hall is still called the Queen's chamber. We have before seen that Horsley removes ARBEIA to Moresby, which others had placed at Workington on no better authority than the Burrough walls, about a mile from the town, which are still standing, though no more than one of those old towers so common in the north, and sometimes called Burgh or Brugh; but it has no other evidences of its having been a Roman station. The rectory of Workington, worth 400£. per ann. is held by Mr. William Thomas Addison, who married a sister of Mr. Curwen, his patron, and has a son in the East-Indies. Fortified tower house with various additions, now in ruins. Mid C14 with C15 and C16 alterations and additions; late 1783-1789 additions by John Carr for the Curwen family. Mixed large blocks of red and calciferous sandstone with additions of similar rubble stone, all without roofs; oldest parts on chamfered plinth. Rectangular 3-storey tower with adjoining L-shaped medieval wing reduced to single-storey and rebuilt as 3 storeys by Carr; also adjoined by C15 hall range of 2 storeys, 5 bays, all enclosing courtyard on 2 sides, the quadrangle completed by a medieval gatehouse tower and wing by Carr. Tower was extensively renovated by Carr but retains some original loops, internal spiral staircase and mural chambers. Late C18 round and flat-headed windows, all unglazed. Wing has projecting 3-storey garderobe turret and ground-floor loops; large first-floor late C18 round-headed window openings, those above in ruins. Late C18 canted bay window to left. Further right-angled kitchen range of similar details, with angle turret. Hall range has blocked windows and doorways of various dates; 2 ground-floor early C16 2-light windows and upper-floor C15 window. Inner wall has C15 doorways and blocked early C16 multi-light windows. 3-storey gatehouse has flanking guardrooms with angle turret to right, showing a number of small original chamfered-surround windows; the round-headed through archway and windows are late C18 alterations. Adjoining late C18 wing has similar flat-headed window openings. Ancestral home of the Curwen family who obtained a licence to crenellate in 1380 (the foundation stone for the tower is said to have been laid 8 May 1362) and owned by them until sold to the local council mid C20. After vandalisation the council reduced the building to a controlled ruin. See Tom Clare, Report on the Fortified Buildings of Cumbria, Cumbria County Council, 1983 (unpublished), appendix 3; Transactions Cumberland Westmorland Antiquarian & Archaeological Society, old series, xvi, 1-15; J.F. Curwen, Castles & Towers, 1913, 244-7. Gate piers for Workington Hall. Late C18 for the Curwen family. Calciferous sandstone ashlar. Square piers surmounted by armorial carved stone unicorn heads (crests of the Curwen family). Flanking wall is rebuilt and not of interest. Listed for G.V. with Workington Hall. At Workington, Workington Hall, John Christian Curwen, Esq. At Workington are Workington Hall, John Christian Curwen, Esq. 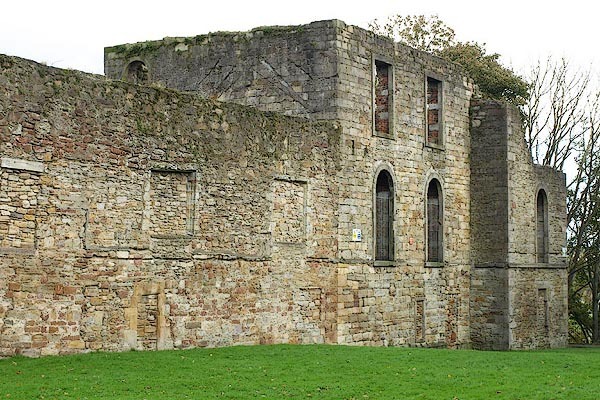 hearsay After her defeat at Langside, Lord Herries led Mary, Queen of Scots, away through the passes of the Glenkens, eventually to his castle, Corrah Castle. 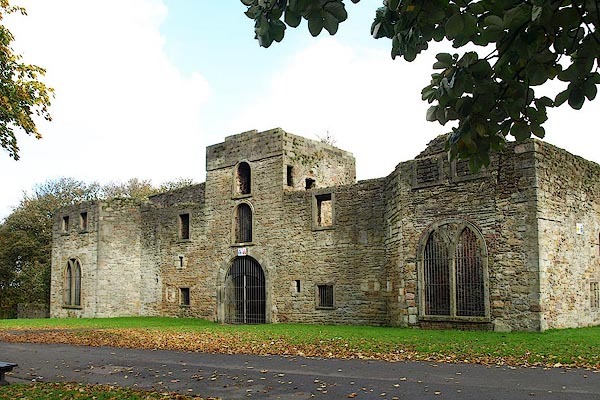 After a stay at Maxwell Castle near Dumfries, she decided to go to England. She left Scotland in a fishing boat from Abbey Burn Foot and crosses the Solway Firth, landing at Workington. As she landed from the boat, she stumbled, believed to be a good omen. She was invited to stay at Workington Hall, home of the Curwen Family.